One of the most successful, free ways to garner sales for you Merch by Amazon t-shirts is by optimizing your shirt listings with relevant, quality keywords. Rather than getting lost in the sea of similar t-shirt designs, help lead your potential buyers to your shirt by taking the time to add suitable, powerful terms to your title, key product features and descriptions. And avoid the “spammy” route. Besides being extremely annoying and against Merch by Amazon policy, no one is going to search “Christmas, cat, dog, zebra, Kwanzaa, ice cream, mechanic or grandpa” to find your “hipster, taco” shirt. A simple search of the term “hipster”, indicated related words such as beatnik, free spirit, liberal, bohemian, freethinker and new age traveler that roughly had similar meanings. So if I’ve designed a tee for a hipster audience, I would certainly want to consider using some if not all of these terms. 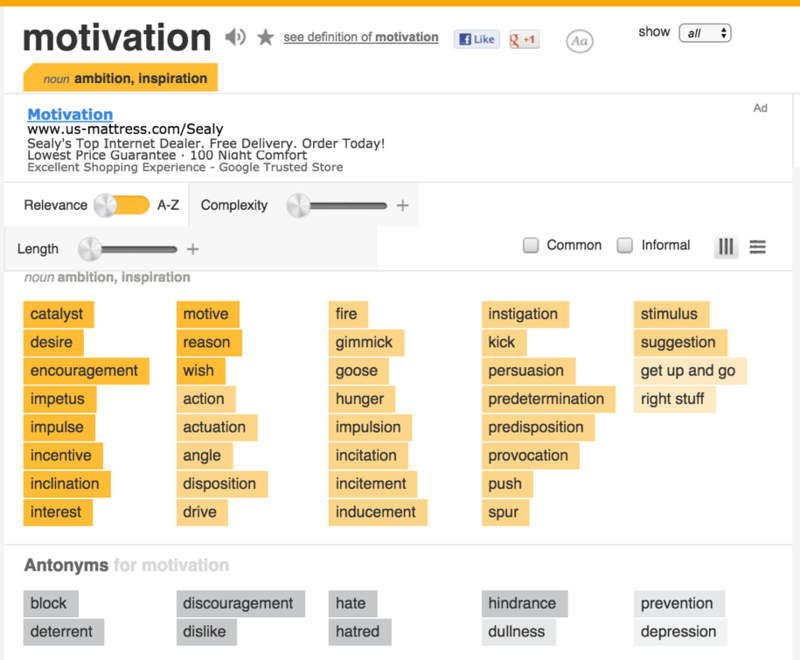 Another simple search, this time for “motivation” yielded over 30 synonyms or similar/related terms and also brought back a list of antonyms (opposing words) that are also sometimes applicable to your shirt. For instance if your shirt is about motivation you may still want to include “deterrent” or “hindrance” in the key product details all though they are in opposition to your shirt’s message. For instance you might use those terms in this fashion for your key product features or description: “Is your lack of motivation a deterrent? Are your inner negative thoughts a hindrance to your success? Break through that negativity with this motivational shirt”. So, where else can you look to identify potential keywords? Below is a list of places you can visit for not only potential keywords but also potential t-shirt ideas. Television – popular shows, commercials, even items you see in the background of shows can provide leads for keywords. Get out of the house – while shopping, driving or vacationing we are inundated with keywords and design ideas. Did you see a bulletin board for an anti-smoking shirt with a similar message to a shirt you just created? What keywords did they use? Use Google Trends – see what people are searching for on Google right now. Conduct research on Amazon – type a term in the search bar to see what similar searches come up. Check out the best sellers list. Is there a unicorn mug on it with fantastic relevant keywords? See if any of those apply to the unicorn t-shirt you just created. Visit niche blogs, forums or Facebook groups – if you enjoy designing shirts based on a particular sport, join a group or follow a blog to pay attention to the terminology and relevant keywords that continue to pop up. Search on wikipedia – scan through the resulting search results as well as checking out the “see also” section at the bottom. Five seconds after typing in “taco” I came up with fajita, burrito, quesadilla, Mexican dishes and nachos amongst several other relevant terms. Click on those online ads – you’re checking out Facebook and low and behold a Father’s Day shirt ad pops up that is very similar to the one you just created. Check out what terms they are using in the description as well as the advertisement. Browse throw newspapers or magazines – if you enjoy designing sports-related t-shirts, scan through those pages to keep abreast of trending and popular keywords. Check out niche websites – if you enjoy gaming, check out some gaming websites to generate lists of not only pertinent KWs but possible t-shirt ideas as well. Ask a friend or family member – does your uncle own a mechanic’s shop? If so, he’d be a great resource for terms related to his industry. Online keyword tools – though most are paid, there are several that at least offer a limited number of free searches. Hire out – if there’s not enough time in the day to write your own keywords, hire out. Ask your English teacher friend, librarian cousin or freelance author sister if they would be willing to work for you. Or outsource to virtual assistants on Upwork or through a service such as VA Rentals. Try to use the quote, saying, main target audience, niche area or theme from the shirt and then add t-shirt on the end. Also, if there’s additional room use as many characters as possible by adding in synonyms or alternate forms of a word. If there are words in the quote that are used multiple times like two “you” words, I drop the second one to leave room for a better keyword. Identify the main keywords, use any synonyms or antonyms for those words and then try to formulate a cohesive story that blends the terms and answers three basic questions. While I leave my product description blank, I break the resulting paragraph into two bullet points and fill in the key product features. While it’s fantastic to fill in both areas, I often have more than enough room next to the bullet points and find myself really having to reach or becoming spammy if I also attempt to fill in the product description area. I also comment on the mood or type of shirt – funny, humorous, sweet, sarcastic, inappropriate, etc. and use the terms t-shirt and tee shirt. BULLET POINT 1: This is the perfect t-shirt for any geek, nerd, bookworm, tech lover, introvert, socially awkward, homebody, sci-fi, magic, fiction loving, book reading, game playing, cool, hipster person you know that has a unique sense of style and exudes geekiness. If you’re geeky and you know it, let that dork flag proudly fly with this graphic t-shirt. BULLET POINT 2: Featuring thick framed sunglasses, a beard and bowtie this tee shirt is a hip option for wearing to the comic book swap, bookstore, library, gaming convention, movies, thrift store, computer lab or simply for everyday wear. Show your pride in your individuality, originality and unique nature by rocking this apparel. Keep a finished description bank. You can get fancy and save them by niche or just save them in one large document. Literally copy and paste them from your shirt listings and use control F to search for a keyword. You’ll find you can almost virtually copy and paste old descriptions with just a few changes to tailor the information for a different t-shirt within the same niche. Create a keyword spreadsheet. Across the top columns use broad terms or niches and beneath, begin compiling relevant keywords. So later on when you’re creating another cross-stitch related shirt, you can go back to your spreadsheet where you’ve saved any relevant terms suitable for the description and title. Also you can visit our Virtual Assistant outsourcing business site at www.va.rentals should you have any research, design or keyword needs for your Merch by Amazon t-shirts.